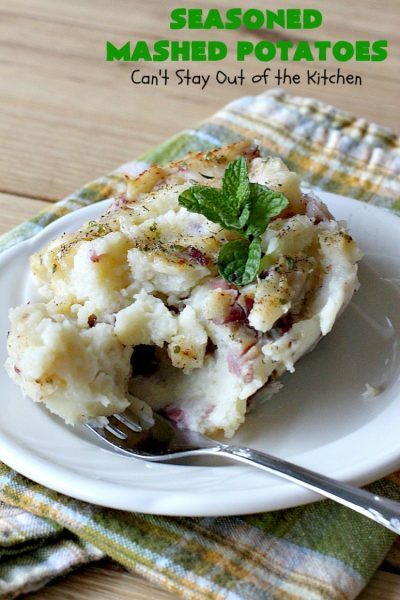 This delightful Seasoned Mashed Potatoes side dish has been a staple in our house for decades! This recipe is SO simple, but tastes so heavenly. 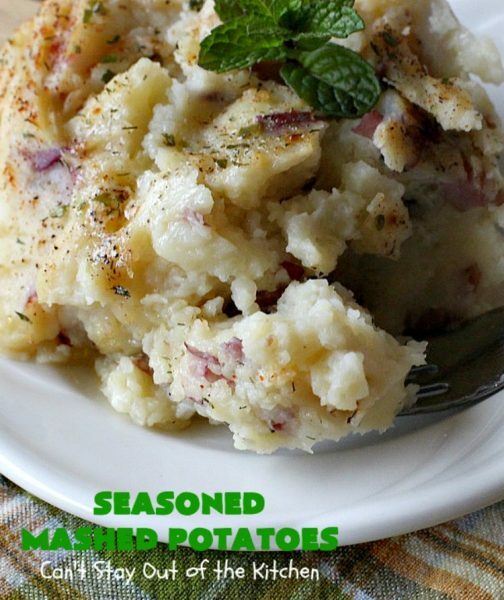 I love Mashed Potatoes. In fact, I love any kind of potatoes—white or sweet–and I enjoy them fixed almost any possible way. Seasoned Mashed Potatoes are special. That’s because of the herbs and spices I put on top before I bake them. I season these potatoes with butter, paprika, dill weed, garlic salt, pepper, parsley and chives. You can also add salt if you desire, but they are very pleasant seasoned this way without salt. 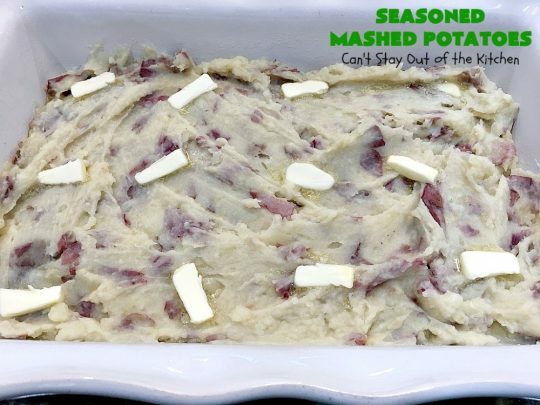 I also really enjoy making these with red potatoes. 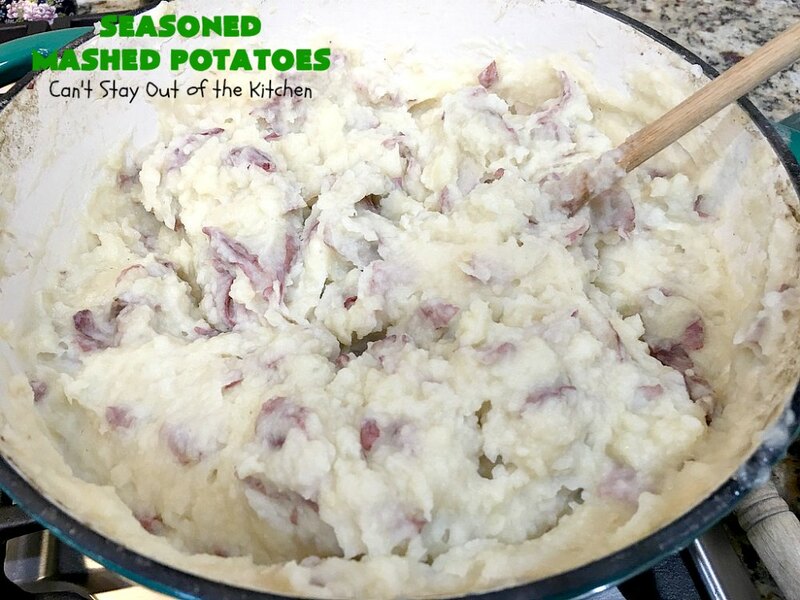 They add a very delicate flavor that can’t be replicated with russet potatoes or most regular potatoes. You’re probably thinking to yourself, paprika? Dill weed? Seriously??? Yes, yes, a thousand times yes. 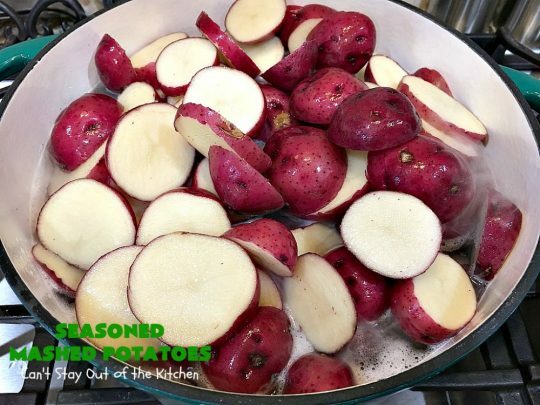 In fact, if you eliminate the paprika and dill weed these potatoes will be a lot more bland and just don’t pack the flavor that a little paprika and dill weed offer. We lived in Massachusetts in the early 1990s. I used to cater board meeting meals for the Baptist Convention of New England. It was a ministry opportunity for me. I never charged the convention for my services. But they reimbursed me for the ingredients I needed to purchase. It ended up costing them about $2-$3 per meal instead of the $8-$10 that most catering services charged at that time. Ray Allen worked with my husband John. He volunteered his wife to help me with a youth evangelism event. From that time on, Carolyn helped me with several catering events for the convention. This usually ended up being between 6 and 8 events per year. 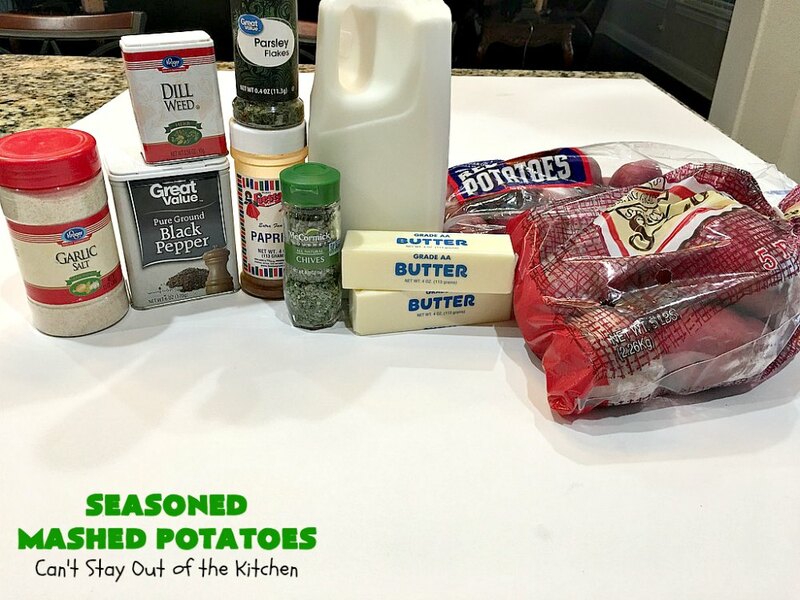 It was Carolyn’s idea to add the paprika and dill weed to the potatoes. I was already using the other ingredients. At first, I second-guessed her. But I decided to try it and I loved the way the potatoes came out. She recommended I use dill weed and paprika on lots of veggies because of the wonderful flavor these seasonings add to veggies. Anyway, I used these lovely seasonings for all kinds of recipes. Those include Fried Potatoes, Seasoned Oven Fries, and Skinny Stuffed Baked Potatoes. It also included any casserole I made that used potatoes in the ingredients list. 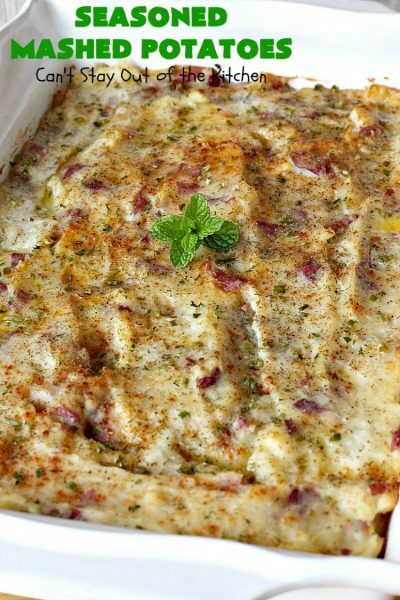 Even breakfast casseroles! I have served Seasoned Mashed Potatoes countless times over the years for our family as well as company. Everyone always enjoys this really simple and easy recipe. Seasoned Mashed Potatoes are healthy, low calorie and gluten free. If you want to make them vegan, substitute Almond Breeze or your favorite Almond Milk for the regular milk in the recipe and coconut oil for the butter. 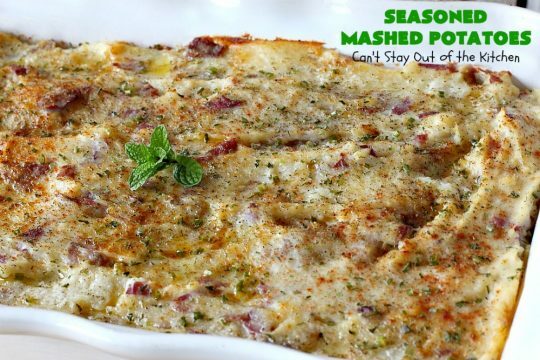 You will still have a splendid side dish your whole family will enjoy. 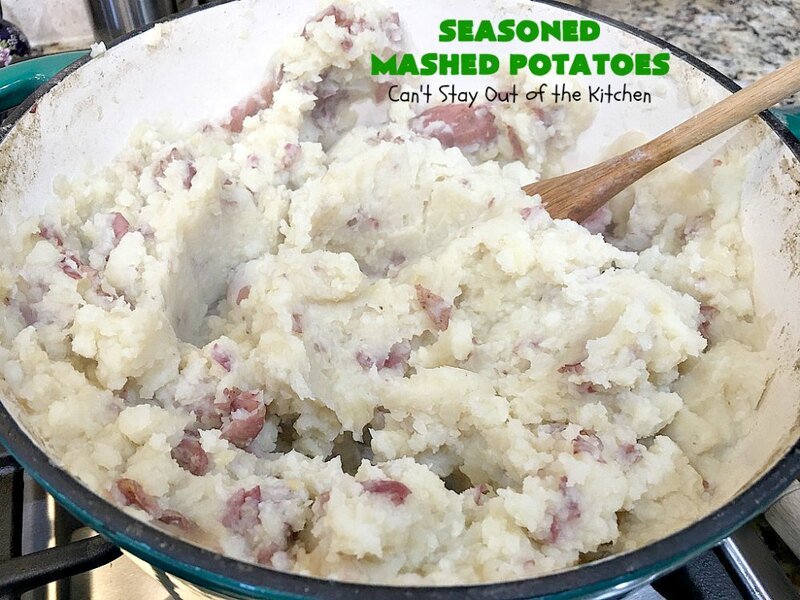 If you want to upgrade your Mashed Potatoes recipe, I highly recommend giving Seasoned Mashed Potatoes a try. And, PLEASE don’t leave off the dill weed or the paprika. 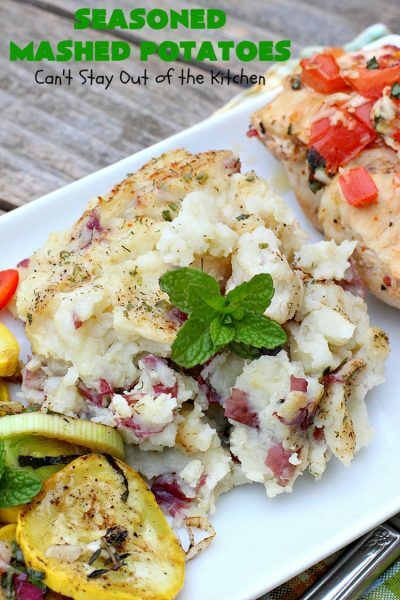 That way you can enjoy the full flavors and effect of this scrumptious recipe. 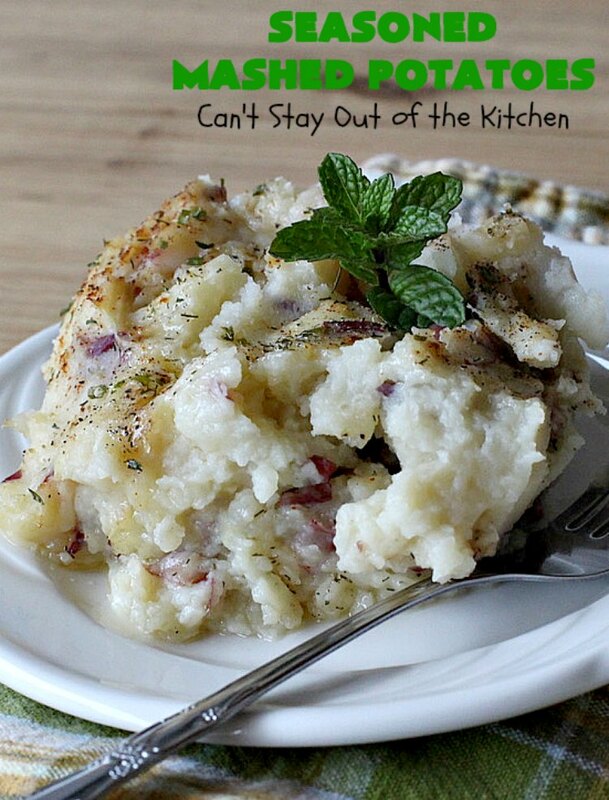 Even your kids will enjoy potatoes prepared this way. 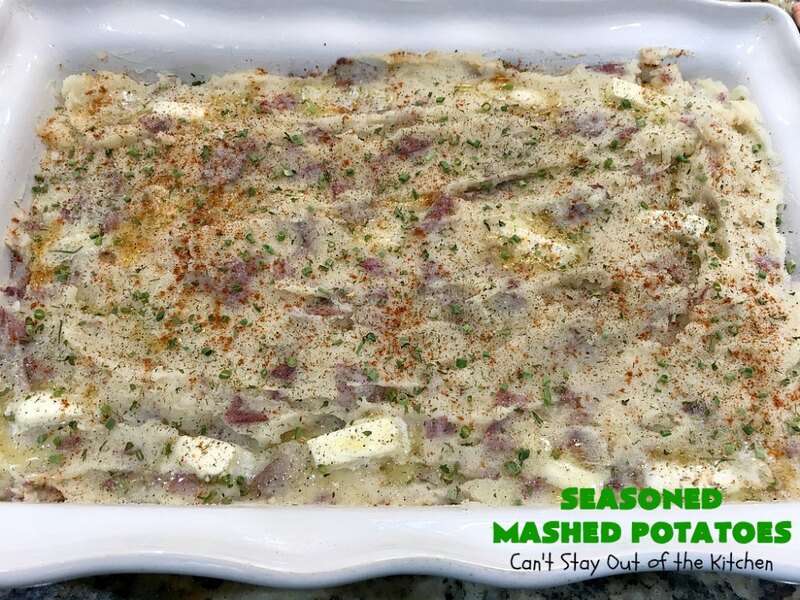 The nice thing about Seasoned Mashed Potatoes is you don’t have to spend a lot of time in preparation. 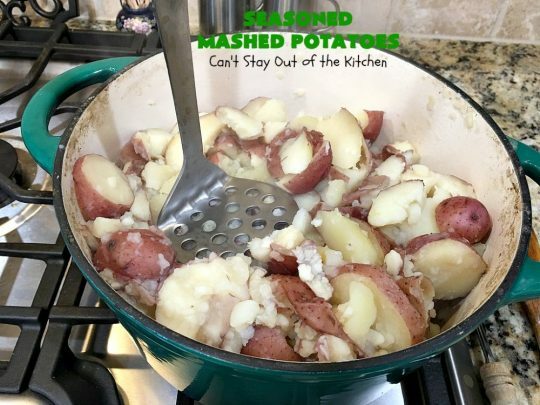 It takes 5 minutes to peel the potatoes, 5 minutes to mash them, and about 2 minutes to add the butter and seasonings before they’re baked. Super simple. Super easy. Super taste. I like that. 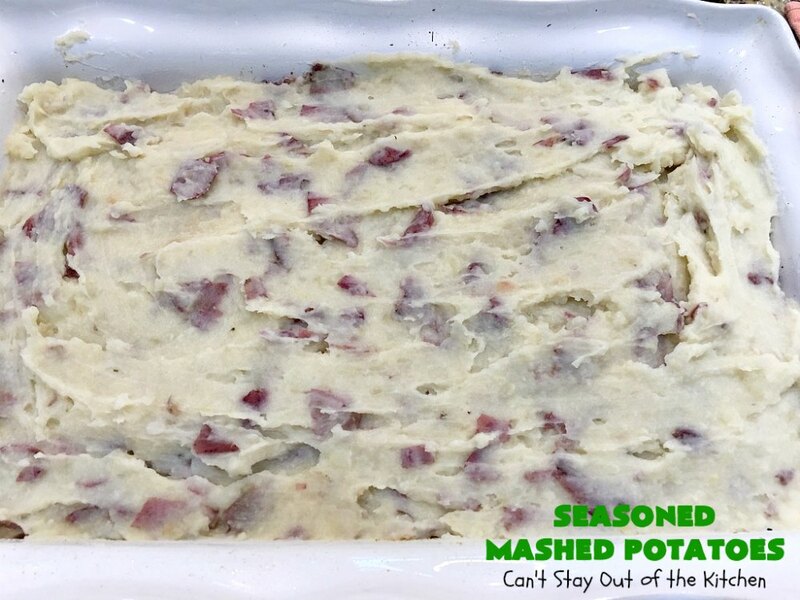 Seasoned Mashed Potatoes are a quick and easy side dish, but elegant enough to serve for company dinners. The seasonings make this dish irresistible. Seasoned Mashed Potatoes are kid-friendly! These potatoes are terrific with Baked Chicken Bruschetta and Balsamic Yellow Squash Bake. Wash red potatoes and slice down. Boil potatoes; drain. I mash them until the potatoes are well mashed but not completely smooth. You want some lumps for texture. Grease a 9×13″ glass casserole dish. 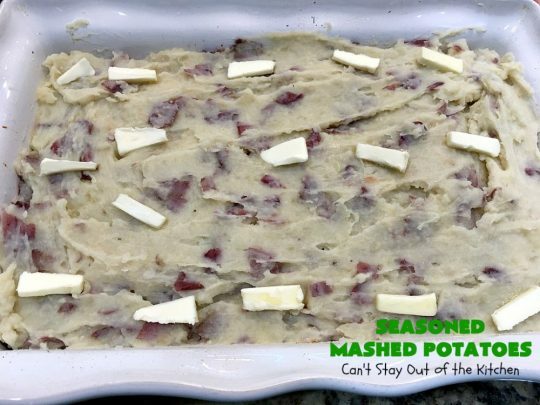 Spread half of the mashed potatoes into prepared dish. Dab the top of the casserole with butter. Sprinkle with garlic salt, pepper, paprika, dill weed, parsley and chives. You can add salt if you wish. 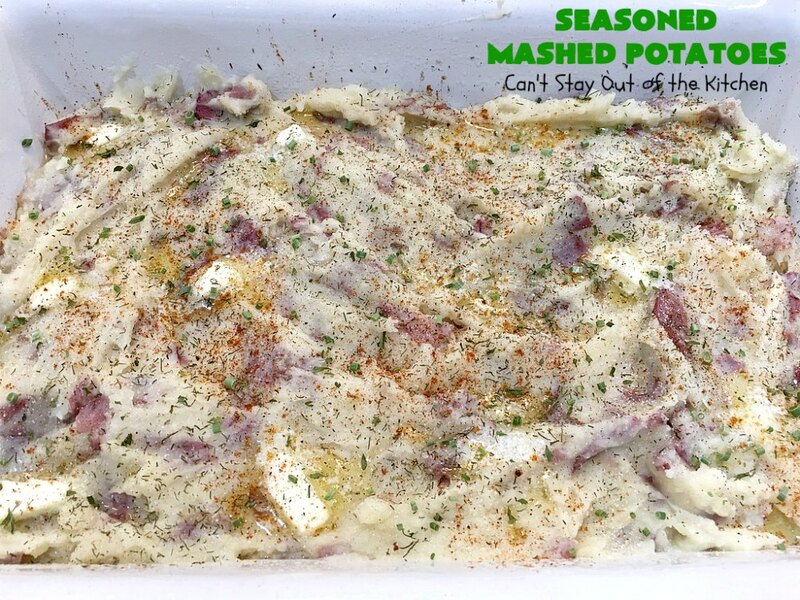 Smooth remaining mashed potatoes over top of seasonings layer. Bake about 5-10 minutes at 350 until butter melts and casserole is hot. 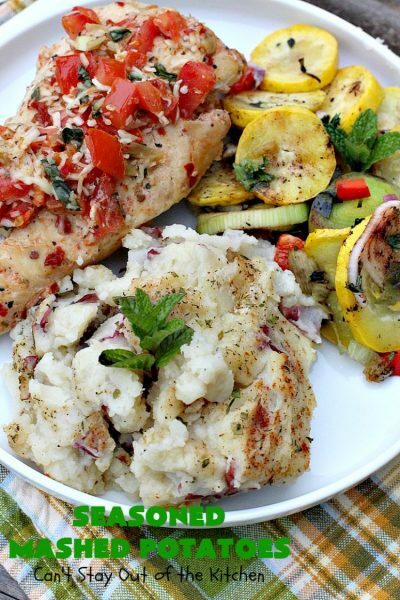 This time I served Seasoned Mashed Potatoes with Baked Chicken Bruschetta and Balsamic Yellow Squash Bake. This quick and easy side dish is kid-friendly and wonderful for company dinners, holidays or on your regular meal menu. 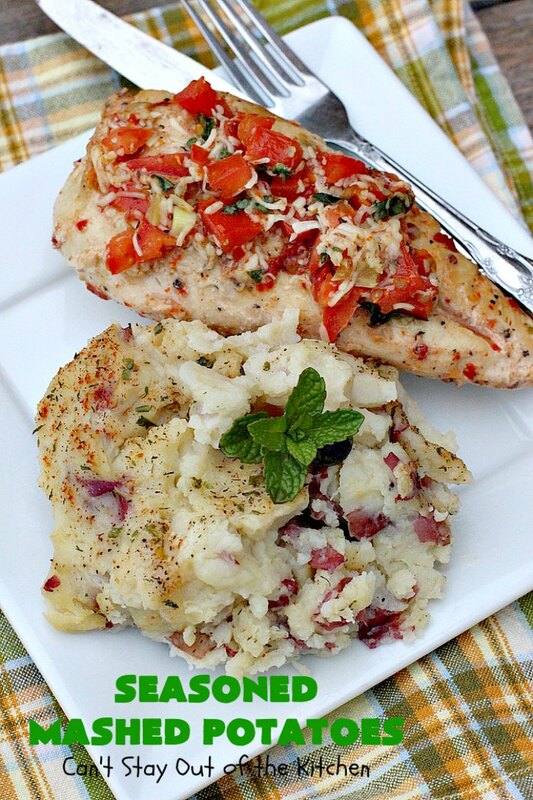 The seasonings are what make this dish special. Gluten free. 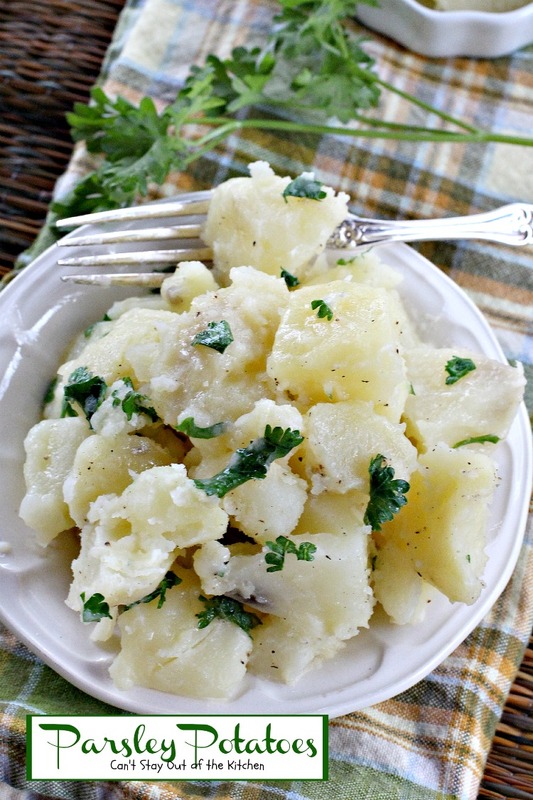 Peel potatoes and cut in chunks. Place in a large stock pot filled with water. Boil until potatoes are fork tender—about 15 minutes. Add 2 tablespoons butter and mash potatoes with a potato masher. 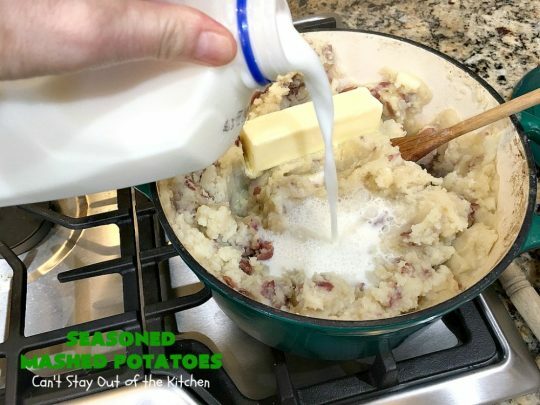 Stir in milk, as needed to make potatoes creamy, but NOT soupy. Grease a 2-qt. casserole dish. 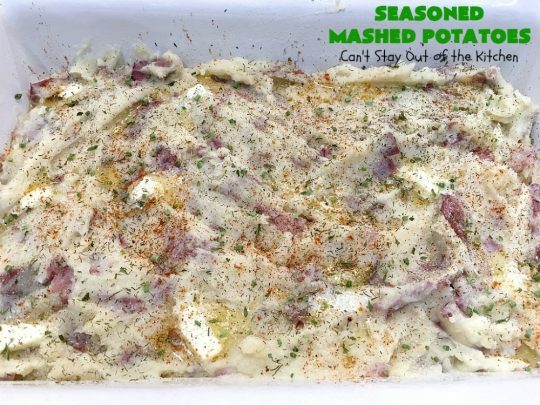 Spread mashed potatoes in dish. 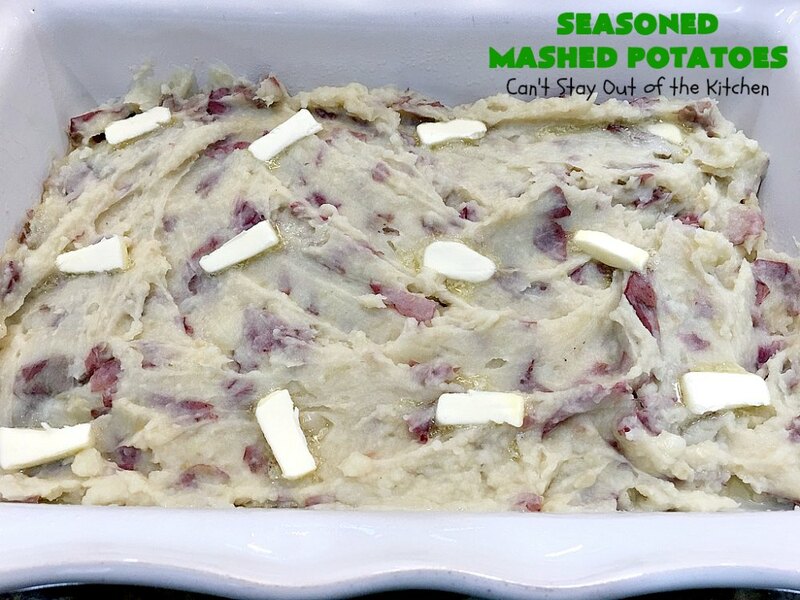 Cut slivers of butter from the remaining 2 tablespoons butter and spread over top of mashed potatoes. Sprinkle seasonings generously over top of potatoes. Bake at 350° for about 5-10 minutes, until butter melts and casserole is hot. NOTE: I give the ingredients above as a base line to start. For these pictures, I used 8 pounds of unpeeled red potatoes, 1 stick (8 tbsp. unsalted butter) and about ½ cup 2% milk to make the mashed potato base. I made two layers of mashed potatoes. Each layer was topped with butter, garlic salt, paprika, dill weed, pepper, parsley and chives. I used 4 tbsp. 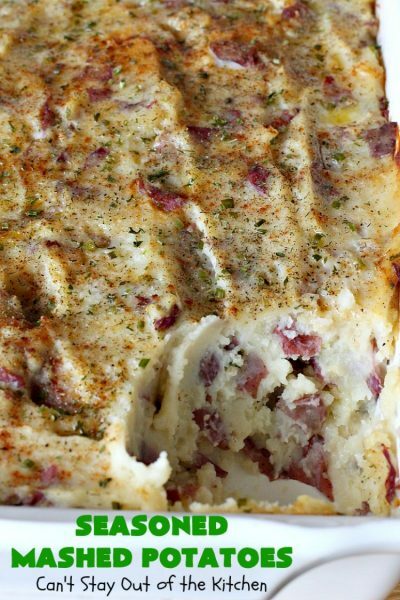 butter to layer on top of the potatoes (two tablespoons on top of each layer). I sprinkled the seasonings lightly over each layer. NOTE: Your preparation time will be cut in half when using red potatoes since you only have to wash them, not peel them. 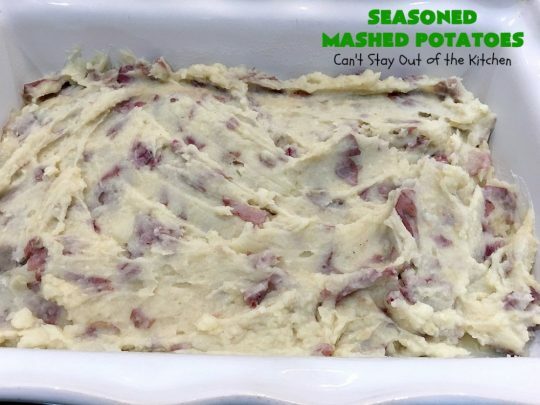 Seasoned Mashed Potatoes usually go fast. Better make plenty! Serve Seasoned Mashed Potatoes as a side dish for any entree. It’s especially good with Chicken and Steak.